This is a mini-seminar. 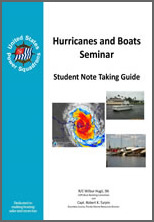 It covers how to select a location and prepare your boat for a hurricane. The kit includes Student Notes with copies of the slides.